Google Analytics is a service offered by Google that generates in-depth statistics about your website's traffic and traffic sources including site referrals, traffic sources and measure conversions of your campaigns. The Google Analytics works via a Google Analytics Tracking code which can be obtained via your Google Analytics Dashboard following the instructions in the official knowledgebase article. To start collecting stats via the Google Analytics the tracking code needs to be implemented on every page of your OpenCart 2 website. 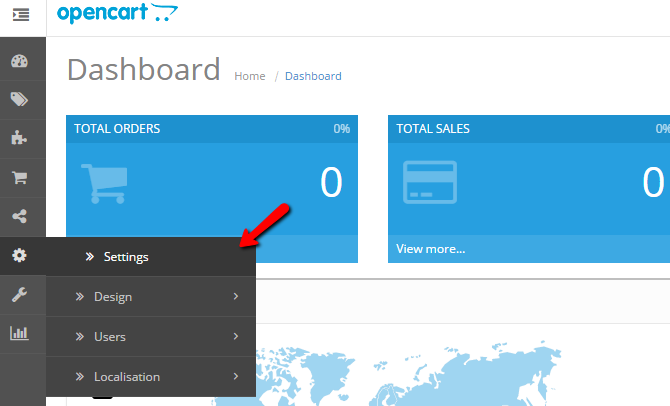 Following this tutorial we will show you how to setup the Google Analytics code with OpenCart 2. To begin, first obtain your Google Analytics tracking code via your Google Analytics Dashboard following the instructions in this article. If you do not have a Google Analytics account yet, you can sign up for free via the Official Google Analytics site. When you have an active Google Analytics account and you have obtained your Tracking code login your OpenCart 2 admin dashboard and navigate to the Settings section via the main navigation menu. Click on the edit icon next to your store name and refer to the Server settings tab. Scroll to the bottom of the Server tab page and locate the Google Analytics Code field. Paste the Google Analytics Tracking code into that field and save your settings via the Save icon at the top right corner of your screen. Now your Google Analytics tracking code is fully integrated with your OpenCart 2 website and you will need to allow up to a few minutes before your stats get updated in the Google Analytics Dashboard.